rec. Roxy Studio, Berlin, 1-2 December 2012. Johann Sebastian Bach's Aria with Diverse Variations is frequently referred to as the pinnacle of his artistic achievement. As such it has been the subject of all manner of interpretation over the centuries, countless of which have been recorded for posterity to cherish and, sometimes, to steer clear of. Highly mannered accounts, like those of Glenn Gould (on a seemingly infinite number of re-releases), Daniel-Ben Pienaar (Avie AV2235) and Nick Van Bloss (Nimbus Alliance NI6136) thus rub shoulders with sometimes baffling arrangements for anything from the accordion (Janne Rättyä, Ondine ODE12092), viol consort or duo (Fretwork, Harmonia Mundi HMU907560), harp (Catrin Finch, DG 4778097), to saxophone quartet (Danish SQ, Kontrapunkt 32330) and marimba (Pius Cheung, private release in 2006). Then there is Max Reger's 'improvement' for piano duo (Yaara Tal and Andreas Groethuysen, Sony Classical 88697526962), Busoni's outrageous reinvention (Claudius Tanski, MDG 312 1323-2), Dmitry Sitkovetsky's arrangement for strings (Orfeo C138851A), Karlheinz Essl's for string trio and live electronics (Preiser PR90753) and - perhaps most notoriously - the Jacques Loussier Trio's jazz re-imagining (Telarc CD83479) and Uri Caine's Frankensteinian monstrosity (Winter & Winter 910 054-2), about which the less said, the better. In more legitimate territory, there have been quite a few organ recordings, with many more on the harpsichord, including some indisputable classics from the likes of Wanda Landowska (Naxos Historical 8.110313), Steven Devine (Chandos CHAN0780), Richard Egarr (Harmonia Mundi HMU907425-26), Christopher Rousset (Decca E4757079) and Andreas Staier (Harmonia Mundi HMC902058). Yet though Staier for one has likened playing the Variations on the piano to "attempting to square the circle", the overwhelming majority of recordings have always been by pianists. Of these, it may be noted, many blithely omit the numerous repeats, effectively cutting twenty minutes or so of music. Among the piano recordings, Murray Perahia's on Sony Classical (SK89243) and Angela Hewitt's on Hyperion (CDA67305) are two of the very best - as close to natural, intimate and reflective as the grand piano can make Bach sound. For the libertarian listener, an enterprising new release from Brilliant Classics gives four versions of the Variations on four discs (for the price of one! ): harpsichord, piano, organ and string trio (94621). Though Bach wrote the Variations patently for a double-manual harpsichord, the clavichord is thought to have been his own preferred instrument for this work. His celebrated son Carl Philipp Emanuel was moreover one of its leading apostles. Yet there have been puzzlingly few recordings on this gentle, venerable instrument - this partial discogra phy lists none. Benjamin-Joseph Steens on Evil Penguin in 2010 (EPRC007) leads the tiny field, with József Gát on Hungaroton (HRC1001) and Jaroslav Tůma on ARTA Records (F1 0136) conspicuous by their lack of competition. Israeli-born Michael Tsalka's new recording thus has plenty of elbow room - not that this is in any way that sort of programme. Tsalka's exquisite musicianship can be heard on two very recent Grand Piano volumes dedicated to the marvellous sonatas of Daniel Gottlob Türk (GP627-28, 629-30, review). He plays Türk on an array of historical keyboards - harpsichord, grand piano, upright grand, spinet, fortepiano, tangent piano and clavichord - giving some measure of the importance he attaches to authenticity. On the present recording Tsalka can actually be heard on two clavichords, both built by Sebastian Niebler after late-18th century models. One has a "lyrical timbre", according to Tsalka, whilst the other is "more robust". He switches between keyboards for the length of the recording, often deciding on the spur of the moment which instrument to use for the next variation. This is his "bow to the spirit of improvisation, freedom and unbound imagination" of the music. Whether he would extend that empathy to all of the interpretations listed above is an intriguing question. At any rate, the alternations add a further layer of enjoyment to Tsalka's handsome, intuitive readings. He demonstrates a masterly control of dynamics, and is moreover thoroughly attentive to phrasing and tempi in a way that totally explains J.S. and C.P.E. 's faith in the instrument. Clavichord recordings are of necessity low-volume, in order to minimise ambient noise - electrical hiss, instrumental action, breathing sounds - but Paladino's engineers have made a reasonable job of ensuring that no extreme demands are made on the listener's volume control, and that effective timbral distortions are thus avoided. The English-German booklet notes are not exactly voluminous, but Tsalka's introductory and Joyce Lindorff's homage to Bach and Tsalka do at least offer a brief glimpse into the performer's state of mind on approaching this immense work. Curiously, Tsalka's bilingual biographies contain certain mutually exclusive details. 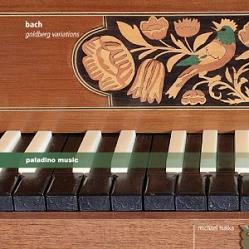 The CD cover says baldly "goldberg variations" which, orthographic issues aside, is fair enough - that is the name by which this work has come to be universally known. Yet Johann Gottlieb Goldberg's association is apocryphal at best, originating, as is frequently the case, in a rhetorical 19th-century biography. As Norman Rubin writes in New Grove, "Forkel's famous story of the commissioning of J.S. Bach's Goldberg Variations [...] by Keyserlingk to be played by Goldberg contains several errors of fact and must be doubted." There is no doubt the sound of the clavichord is an acquired taste, probably even more so than the harpsichord, but for those with an interest in historical authenticity who wish to deepen their understanding and appreciation of this keyboard masterpiece, Tsalka has much to tell.